Later Dutch settlements were established new what we now know as the Delaware Water Gap. The Dutch were then pushed out by English and German settlers, and the first permanent Poconos residence was established at Shawnee by Nicholas Depui in 1725. 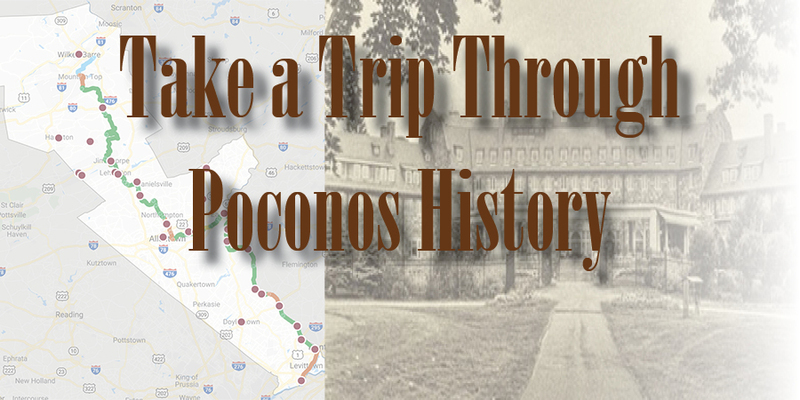 You can actually take a trip through Poconos history on a route that leads you from Wilkes Barre in the north to Levittown in the south. You can traverse the trail in the opposite direction as well if you’re starting out near Philadelphia. Let’s take a look at a few of the places you may want to explore. Here are X historical sites to visit in the Poconos. In the 1800s, hundreds of thousands of immigrants flocked to the region to work the coal mines and Wilkes-Barre in the very heart of the anthracite fields. It was an ideal location for development. Along with that development came inevitable economic and cultural changes that transformed what had been a rural farming region into a thriving urban center. Wilkes-Barre became the region’s financial center and home to rich and powerful entrepreneurs. One of the best places to glean some insight into Wilkes-Barre’s past is the Luzerne County Historical Society Museum on Franklin Street. You can peruse Native American exhibits, anthracite coal displays, and presentations that highlight some of the important natural and cultural events of the Wyoming Valley. The town of White Haven got its name from Josiah White, who was the co-founder of the Lehigh Coal and Navigation Company. The location of the town put it at the crossroads of two major transportation arteries: the Lehigh Canal and the Lehigh & Susquehanna Railroad. During the town’s height, residents would have observed hundreds of railroad cars, loaded with massive amounts of stone coal passing through. They also would have seen mounds of timber cut from White Haven’s surrounding forests, waiting to be transferred onto the Lehigh Canal’s barges. The barges and the steam railroads are long gone, but you can still catch glimpses of the town’s glory days. Originally established in 1818 as Mauch Chunk (and later renamed after the legendary Native American athlete), the town was the home of entrepreneurs such as Josiah White who formed the Lehigh Coal & Navigation Company in the 1820s, and shipped countless tons of anthracite coal and other goods to market via the Lehigh and Delaware Canals. The town’s steep hillsides, narrow streets, and terraced gardens earned it the nickname “The Switzerland of America.” The restored Old Mauch Chunk Railroad Station in the center of the town offers visitor services and train rides into Lehigh Gorge. You can wander through the Asa Packer Mansion. Built in the Victorian Italianate architecture style in 1861, this beautiful home was the residence of Asa Packer— the multi-millionaire who built the Lehigh Valley Railroad and founded Lehigh University. You can also tour the Old Carbon County Jail, once occupied by the Molly Maguires—the Irish mining organization that fought for better working conditions for the miners of the day. Located at what the Lenni Lenape Indians called the “Forks of the Delaware,” the city of Easton sits on the banks where the Lehigh and Delaware rivers converge. This has been its location since the mid-1700s when the frontier town was laid out by William Penn. In typical Penn style, the town’s focal point was (and remains), a large central square. This square has a unique place in history as it was the site of the first public reading of the Declaration of Independence outside of Philadelphia in 1776. To explore Easton’s past, you can start in Centre Square, where you will find the Crayola Experience and the oldest continually running open-air Farmer’s Market in the United States. Historic walking tours are also available along with horse-drawn carriage rides. Here, at the southern terminus of the D&L Trail, Bristol was first settled by Europeans in 1681. The location along the Delaware River made it a busy port and industrial town in the 1800s where coal yards, warehouses, and large textile mills sprang up along the canal. Bristol is the oldest town in Bucks County and the third oldest in all of Pennsylvania. Its Delaware Riverfront resembles a New England seaport due to the influence of the Merchant Shipbuilding Corporation, which arrived in the town in 1917. During World War II, the shipyards were converted for use in the manufacturing of aircraft. Today, Bristol hosts special events near the river, providing a perfect opportunity to stroll, shop, or dine within the 50-site Radcliffe Street Historic District. These are just a handful of the fascinating small towns along the Delaware and Lehigh National Heritage Corridor. Click here for a closer look at the more than two dozen historic towns and villages along this corridor.